Michael Dougherty says he's probably saved close to $200,000 in the past two decades without a car. In the last two decades, Michael Dougherty figures he's saved at least $200,000. The Whitehorse man hasn't owned a car since 1998 and walks everywhere. He made the decision while faced with a conundrum in August of that year. His wife was moving to Montreal to support their 14-year-old's figure-skating career and she was taking the family van with her. Michael, a teacher, said he decided to stay in Whitehorse because, as he puts it, his skills were much less portable. With the family car gone, Michael took up walking. 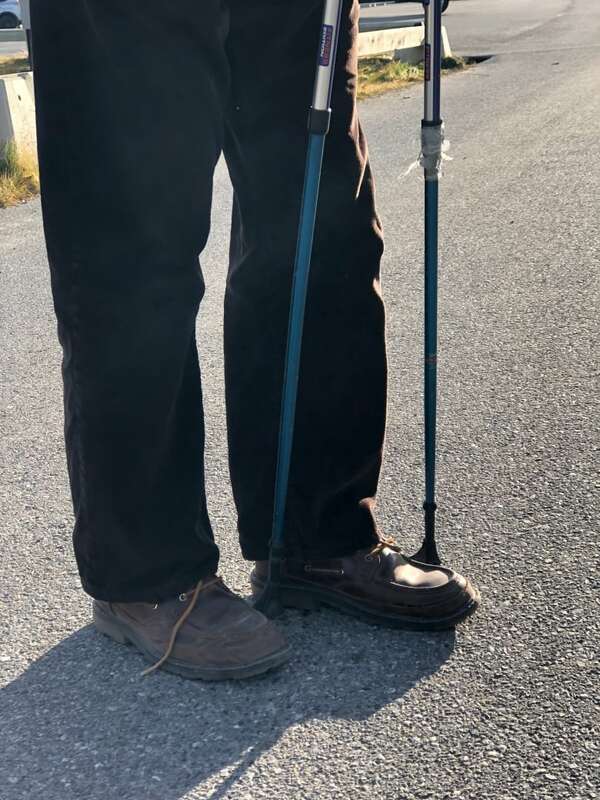 "For me, it was a combination of ethics, health, economics and a variety of other points that made walking just a much more attractive option than hooking into the car addiction that Yukoners notably suffer from," said Dougherty. "Statistics bureau last year told us that we are over one registered vehicle for every man, woman and child in the Yukon." After more than 20 years of car-free living, the 70-year-old man has no regrets. In fact, he said he couldn't be happier. "We know that the car is the second largest household expenditure … just what people have to put up with to support the bloody vehicle … it's a headache," said Dougherty. "Insurance, standard repairs, maintenance, fuel — we're looking at about $10,000 dollars a year. There's no question that's a considerable lump of coin." Dougherty still teaches and every day he walks to and from the high school. Michael Dougherty's main mode of transportation is walking. He hasn't owned a car for two decades. It's a trip that takes him about 20 minutes each way. He's also active in the community, working with close to a dozen different organizations, be it chairing the writer's roundtable, working with the anti-poverty coalition or sitting on the board of the urban gardener's society. And for every meeting or event, it's his two feet and a heartbeat that get him there. Dougherty said his health has benefited too. He comes from a family with a long history of diabetes. Both his parents and all of his siblings have the disease, but Dougherty does not. "No medications, no health conditions, just a multivitamin," said Dougherty. "Walking is one of the things that has assisted in maintaining good health, both mentally and socially, not to mention the health of the planet." Dougherty said he isn't against cars entirely and often rents one himself. He just thinks car ownership isn't worth it. "We only spend about an hour a day in the actual vehicle," said Dougherty. "I think if we all take a slow pledge … you can certainly make for a healthier individual life as well as a healthier global community."